Select one of the packages below to help you meet FDA / USDA / Health Department and Retail documentation standards. If you only need s single plan, we recommend the “Non-Member” package. For those you need multiple plans and need a more comprehensive food safety program we recommend the Standard, Premium packages for immediate savings. Have more than one facility? See the Enterprise option. A great fit if you are looking for a food safety / HACCP plan with no monthly commitment. Perfect for manufacturers, restaurants, distributors, and farms with many products. All Software Packages Have the Basics Covered With Features To Generate and Maintain Compliant Food Safety Documentation. Get a fast start on writing plans from already developed plan templates. They include process flow, hazards, controls, and ingredients. Access a World Class Food Safety Expert Marketplace for services such as plan writing, lab validation, and more. Use the step-by-step food safety plan generator to create Hazard Analysis and Critical Control Point and Preventive Control plans for the Food Safety Modernization Act. Mobile accessible logs to track operations such as receiving ingredients, storage and cooking temperatures, corrective actions, training, and more. An easy to use, drag-drop process flow designer to create the process flows and visually indicate hazards and ingredients of your product. Create new or use a library of templates to create your Standard Operating Procedures. A dynamic checklist of the latest Title 21 of the Code of Federal Regulation Part 117—Facility Current Good Manufacturing Practices – Subpart B. Store and organize all of your important food safety documentation. Automatically generates plans to prepare for and manage food product recalls. ALL INCLUSIVE PACKAGE! ConnectFood offers fast access to our partner network of experts that can assist in writing your HACCP or Preventive Control food safety plans. ConectFood offers an all inclusive package for those that want help with creating FDA / USDA / State Health Department compliant food safety food safety plans. In addition to ConnectFood’s plan generator and maintenance software, ConnectFood’s On-Demand Expert Services provides fast access to a marketplace of food safety experts and laboratories that are matched to your food safety needs at a fraction of traditional consulting costs. Also, included is the “Non-Member” per plan fee of the software for free, a value of $199. There is no financial commitment to request a free quote for services. The price range of the all inclusive package is $900- $1400 depending on the type of food product. Want to view each of these services individually? We focus on making the software as simple to use so you can dive right in with little to no experience in food safety. We will guide you through each step and give you on demand access to experts to review your work. The process flow is the core component of HACCP and Preventive Control plans that best ‘tells your food safety story”. Here’s a short video to show how fast and easy it is to design your process flow and add associated biological, chemical, and physical hazards. Just drag-drop the process steps into place on desktop of mobile devices, and you are off to the races in a fraction of the time that it takes to develop this using traditional word documents or older software systems. 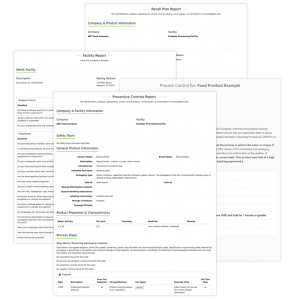 ConnectFood offers several key reports that can be used in the event of an inspection or food safety audit along and also for retail executives when selling product. The Recall Plan is offered on a per food product basis to be used to notify stakeholders and track recall events. The Recall Plan also has the capability to auto generate recall notification scripts. The Facility Reports contain the facility’s Current Good Manufacturing Practices Survey based off of CFR 117 Subpart B. The Expert Safety Letter is written by a food safety expert such as process authority to deem a product safety for consumption based off of a food product’s scientific attributes. Lastly, the food safety plans can be output in either the new Food Safety Modernization Act Preventive Controls format or in the Hazard Analysis and Critical Control Points (HACCP) formats. ConnectFood seeks to ‘educate and elevate’ the level of food safety knowledge of its community as needed to complete their food safety plans. Incorporated in the food safety planning process are components of the FSMA Preventive Control Qualified Individual (PCQI) training. 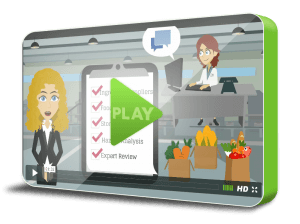 While creating food safety plans, contextual videos, graphics, instructions, tips, and examples are provided at each step. Also, a search based help center is provided. Are Expert Services included in a subscription? Expert Services for activities such as helping to write a plan, reviewing a plan, SOP development, and more from our partner network in addition to the software subscription and based on a per project basis. It is free to request a quote from our partner network. Here is the list of expert services and pricing. I’m a supplier responding to an account invitation, how do I upload my documentation? First, welcome to the ConnectFood supplier network! Here are the steps to upload the documents, please click here. How does ConnectFood’s food safety plan generator create HACCP and Preventive Control plans? Click here to see a getting started article on how to use the step by step the Food Safety Plan Generator. Does ConnectFood help with meet the requirements of the Food Safety Modernization Act for Human Food? Yes, ConnectFood’s food safety plan generator was designed specifically to take a company step by step through the requirements of the planning process. The ConnectFood Platform also gives access to food safety experts that can review your food safety plans to check if they are compliant with the latest rules and regulations. Can I save the plan I’m working on to my hard drive? ConnectFood automatically backs up your data every few seconds, and every time you click “Save” or “Add New” or “Create” for a particular task. All your plan and account information is saved securely in our online servers, ready for you and your invited users to access when you need it. You can always print a copy of your plan as a PDF file to save to your computer if you know you will be without Internet access for a while and want the content handy. But there’s no need to save your data offline for backups. Can I import our list of suppliers and ingredients from Excel or a Comma Separated File? Yes, ConnectFood has an import function to get you started if you have a long list of suppliers and their ingredients. Contact the ConnectFood support team to assist with this at:support@connectfood.com. Yes, ConnectFood has no long-term contracts. You can easily also change from a monthly to an annual plan or cancel at any time. Your plan is 100% yours at any time. You can take your plan with you when you go. If you decide to end your ConnectFood subscription, just export your plan before you sign out for the last time. How does the 60-day money-back guarantee work for Expert Services? If you find ConnectFood Expert Services is unsatisfactory, just contact us via email, phone or even within the app within the first 60 days and we’ll gladly refund your money. Can I use ConnectFood on my iPad or mobile phone? You sure can. Some features are even easier to use on a laptop or desktop computer such as the drag-drop process flow designer, but all features can operate on all mobile devices. We happily accept Visa, Mastercard, American Express, and Discover credit cards. An Account Clearing House (ACH) payment method can also be established, please contact the ConnectFood support team to assist with setting up the ACH account:support@connectfood.com. You’re protected with our 60-Day Money-Back Guarantee regardless of payment choice. Have questions about our software or services? In need of HACCP or FSMA food safety plans? Call +1 (800) 784-8621 or click the “Contact Us” button below.